The ‘Marketing & Communications Strategy’ category highlights exceptional originality, marketing excellence and innovative thinking across a fully integrated programme or campaign including social media. Excello Law was also shortlisted in the ‘Law Firm of the Year’ category which recognises firms that can demonstrate extensive development and progress as a business in 2018 including strategy, growth, financial performance, employee development, diversity and training. The award was collected by Chief Marketing Officer Lesley Potter and Recruitment Director Joanne Losty. 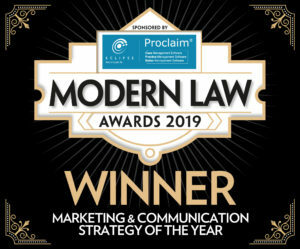 The post Marketing award win for Excello Law at Modern Law Awards 2019 appeared first on ExcelloLaw.co.uk.